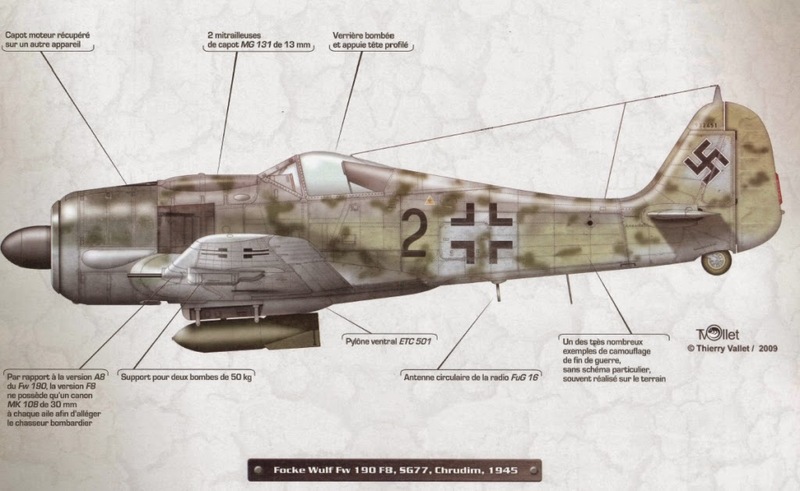 The Focke-Wulf Fw.190 F-8 was the most mass-produced variant of the Fw.190F series, based on the Fw.190A-8. By March 1944, Fw 190F-8s were also produced by the Arado Company in Warnemuende, and by April the NDW Company in Wismar. The aircraft was powered by the BMW 801 D-2 engine with improved injector on the compressor, which provided emergency power for up to 10-15 minutes at 1,000 meters of altitude. Otherwise the plane’s equipment was largely similar to the A-8, although the FuG 16 ZY radio was replaced with the FuG 16 ZS in April 1944. This allowed for direct communication with ground troops on the battlefield. A distinctive characteristic of the F-8 was a widened rear canopy. The new canopy was introduced in the latter half of 1944. It improved forward and downward visibility, which was very important for ground attack. On-board armament consisted of twin MG 131 machine guns in the fuselage and two MG 151/20E cannon in the wings. In the spring of 1944 the F-8 model replaced F-3 on assembly lines.The base for the plane was A-8 armed with two MG131MGs in fuselage and MG151/20E in wings. It was quite short series and then the new model F-8/R1 was intruduced. Its armament was extended with underwing ETC50 (later with ETC70 or ETC71 ) bomb racks.In addition the new bulged cockpit conopy was introduced. Fw 190F-8/U3 - torpedo plane adapted for transportation of the heavy BT 1400 torpedo on an under-fuselage mounted ETC 502 pylon designed especially for this in TWP Gotenhafen-Hexengrund (see the section "Operational use"). His plane had a lengthened tail wheel strut to eliminate the possibility of striking the ground with the torpedo. The plane was equipped with the TSA 2 sight system coupled with a FuG 101 radio altimeter. This version was powered by the more powerful 2000 hp (1470 kW) BMW 801 TS engine. The Ta 152 tail was also mounted. Fw190F-8/Pb1 - Panzerblitz 1 (Pb 1) system was developed consisting of six and, more often, eight R4M air-to-air missiles. They were adapted for tank destroying by mounting an 80 mm M8 type warhead for an armour penetration of up to 90 mm. Using the Pb 1 unit it was possible to destroy tanks at a 200 m distance with rockets being fired in salvo or in pairs. The only limitation was a maximum speed of 490 km/hr, not to be exceeded during missile firing. Up to February 1945 the Luftwaffe received 115 Fw 190F-8/Pb 1 planes. Fw190F-8/Pb2 - Panzerblitz 2 (Pb 2) unit( the successor to the Pb 1 unit). The main difference between them was the replacement of the M8 warhead by a hollow-charge warhead able to penetrate up to 180 mm armour. Also developed was the new missile system Panzerblitz 3 (Pb 3) with a 210 mm hollow-charge warhead, but it was not operational by the end of the war.